Thank you. I have checked ebay, but not Craigslist. This is the e-meter that sold new for over $3,000. The e-meter powers up and registers properly as shown in the picture but is untested beyond that. Sold as pictured with no accessories. I checked eBay but I sure missed that one. Thank you, Mimsey! I have the old style emeter, Mark IV I think it was called. It is in mint condition because I put a nice coat of satin varnish on it when it was new. I don't have the charging cord nor the leads anymore but you can have it if you pay the postage. It probably needs new rechargeable AA batteries too as it has sat unused for nearly 4 decades. I can put it for sale on Ebay for the highest bid, then you can make a minimal bid and Ebay will process the transaction including giving me a printed out shipping label and they can collect the shipping cost which will depend on how far you are from Florida. With shipping it should cost well under $20.00 if you're interested in it. It will be amazing if someone pays $50 for that piece of trash. Thank you for the generous offer. I am in NC. Large Flat rate box would likely be best, but it may not be convenient for you. First, I need to be sure my electrical cord and leads off of my Mark 6 will work on it, as parts for the Mark 4 may be hard to find. Secondly, I need to be sure the Mark 6 can't be fixed. I have a thread on it in Facebook and have gotten some advice on it so far. I will be in touch. Thanks again! 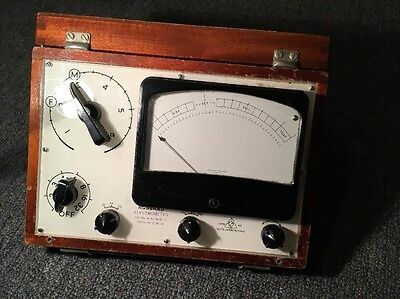 Did anyone ever make a digital read-out e-meter? I heard some talk of it once upon a time. A hand-held meter would be great for ghost-busting, I bet. There are TV shows devoted to that, aren't there? 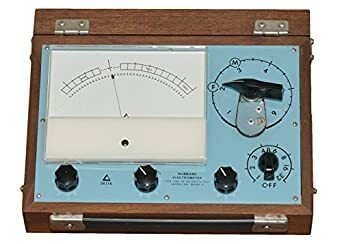 You should spring for a later meter unless the meter is an azimuth alignment mk IV - that's a collectors item - Dagwood are you sure it's not a mark V like the ones below? Solo auditing, with or without a meter, can cause you to go insane. LRH is a prime example. LRH was insane before that but the auditing reinforced his delusions. Thank you. I took my Mark 6 apart and found a blown fuse. I have fuses ordered, but there could be other damage. However, a friend is sending me a Mark 7 for the cost of shipping. All is good. Thanks again for your offer. I have found the problem with my Mark 6 and I have a Mark 7 on the way for shipping cost only. It looks like I am blessed with meters. Thanks for the offer, Terril. Yes, but who with more than two brain cells to rub together watches them?